In recent years, to commemorate historic occasions and other events, the Supreme Court has convened for oral argument at special sessions in Fresno, Orange, Riverside, San Diego, Santa Clara, and Ventura Counties and at the B. F. Hastings Building in Old Sacramento. These special sessions provide opportunities for students and other interested members of the general public to observe argument before the court. The Supreme Court also convenes to honor justices and court staff in memorial services. See the Justices page, under the name of the individual justice, for memorials for selected members of the Supreme Court. In one exceptional instance, Bernard Witkin – the preeminent California legal scholar, was also honored in this way. 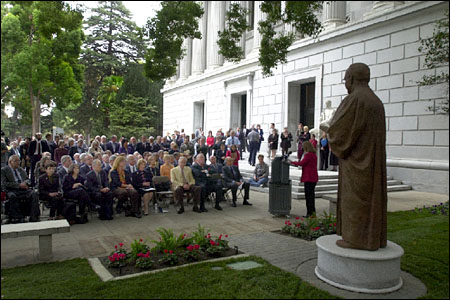 The Supreme Court of California, on Wednesday, November 6, 2002, convened in special session for the rededication of the Library and Courts Building as the Stanley Mosk Library and Courts Building. Present: Chief Justice Ronald M. George, presiding, and Associate Justices Kennard, Baxter, Werdegar, Chin, Brown, and Moreno. Officers present: Frederick K. Ohlrich, Clerk; and Brian Clearwater, Calendar Coordinator. Court reconvened in special session for the rededication of the Library and Courts Building as the Stanley Mosk Library and Courts Building. CHIEF JUSTICE GEORGE: Good afternoon, ladies and gentlemen. We gather today in honor of our esteemed and departed colleague, Justice Stanley Mosk. For the first time, the California Supreme Court this week convened in what is now the Stanley Mosk Library and Courts Building. I am pleased that those present today include the Presiding Justice of the Court of Appeal for the Third Appellate District, Arthur G. Scotland, and several of his colleagues, who hold regular sessions in this magnificent courtroom. I am also informed that we have present–at least he was to be here–our former colleague, Justice William Clark. We have members of Justice Mosk’s staff; Robert Wandruff, the former Clerk and Court Administrator of the Supreme Court; and numerous appellate and trial judges from various areas in the state. We have among our constitutional officers here Attorney General Bill Lockyer; Insurance Commissioner Harry Low, former justice of the Court of Appeal. We have legislators, including John Burton, the Present Pro Tem of the Senate, who will be speaking at this proceeding this afternoon, as will be Assemblymember Helen Corbett. Also, Assemblymember Sally Havice, Bill Leonard, Anthony Pescetti, and Darrell Steinberg. Our resident historian, the State Librarian Kevin Starr; James Herman, the president of the State Bar; and, I believe, a couple of former legislators: Phil Isenberg; Quentin Kopp, now a judge of the San Mateo County Superior Court; and members of legislative staff, some of whom were very helpful in helping the Legislature put this together. I apologize for anyone I have omitted. Just a few moments ago, we unveiled a magnificent memorial to Justice Mosk — a great likeness, cast in bronze. And what an appropriate continuing reminder of Stanley Mosk it will be: It is larger than life, it is enduring, and it is forward-looking. Stanley Mosk was a part of public life in California for much of the last century. He has especially been on our minds in the past two years. In December of 1999, he became the longest serving justice ever to sit on the California Supreme Court, and we convened a special session of the court in San Francisco in his honor. He served an amazing almost 37 years on the court.<? <p>After his death in June of 2001, he was eulogized throughout the state as a great jurist and a great human being. Just a few months ago, the Los Angeles County Superior Court courthouse was renamed for Justice Mosk. Even his title lives on, since his son, Richard, joined the Court of Appeal and became the second Justice Mosk on the Second Appellate District. Like so many others, Stanley Mosk came from elsewhere to California; in his case, from Illinois, armed with a legal education from the University of Chicago. He brought with him a keen intellect, a personable manner, and a sense of a brighter tomorrow. Although he came to California from elsewhere, like so many others he became a Californian. He believed that things could be better in California, and that he could help make them better. And so it was that in his earliest decisions as a superior court judge, Stanley Mosk ruled for racial equality before the rest of the nation began moving forward. As Attorney General, Stanley Mosk moved beyond the traditional law enforcement concerns of the Department of Justice and established new sections focusing on constitutional rights and consumer protection. As a justice of the California Supreme Court, Stanley Mosk helped pioneer the doctrine of independent state constitutional grounds to provide greater protection of individual liberties in California. On a personal level, Justice Mosk was an inspiring leader and a mentor to many. I feel fortunate to include myself in that group. I began my career in the Mosk Department of Justice, as did John Burton, our Senate President Pro Tem, who is the moving force behind this memorial today. John and I are among the many who were inspired into a lifetime of public service and commitment to the greater good because of an association with Stanley Mosk. By his example, he inspired many of us to believe that California was different, that things here could be just a bit better and even somewhat nobler, and that we had the opportunity and, indeed, the obligation to help further along the California dream. Today we celebrate Stanley Mosk’s contributions to the State of California. John Burton and his colleagues in the Legislature have honored Justice Mosk by placing his name on one of the grandest and most glorious buildings in California’s capital. In so many ways the Library and Courts Building fits Stanley Mosk, and I find this to be an especially appropriate place for his memory to live on. First of all, this building is a fitting memorial to Stanley Mosk because it houses a library. Stanley was a great and voracious reader. Quite frequently he would circulate to his colleagues articles from an astonishingly wide range of sources. He seemed to take special delight in passing along readings in which a learned author supported his position, especially if his colleagues had not had the wisdom to agree with him. Stanley was also a powerful and prolific writer. In his record-setting service on the Supreme Court, he authored almost 1,700 opinions spanning 88 volumes of the California Official Reports. For most of his tenure he was the most productive member of the court, writing more opinions than any of his colleagues. He tackled some of the most difficult and contentious issues of his time. And he did so with a clarity of thought and a directness of expression that guided lawyers and judges throughout the state and, in many cases, throughout the nation. Second, this building is a fitting memorial to Stanley Mosk because it is a home of the courts. Stanley loved being a judge. For 53 years of his life he wore the black robe of the judiciary: 16 years as a judge of the Los Angeles Superior Court, and almost 37 years as a justice of the Supreme Court. He was especially proud when he established his place in history as the longest serving member of the California Supreme Court. But we all recognize that Stanley Mosk’s legacy as a jurist is even more notable for its exceptional quality than for its quantity. Stanley wanted to go on being a judge and resisted retirement with all of his considerable energy and effort. As some of you know, he had finally and quite reluctantly come to the conclusion that it was time for him to retire. In fact, he had planned to mail his letter of retirement to the Governor on the day he died. I feel certain Stanley died just a little happier knowing that the letter never made it to the mailbox. Third, this building is a fitting memorial to Stanley Mosk because of its colorful history. Stanley loved the “old California” feeling of the Library and Courts Building, which had its origins in the early 1900’s when California was not far removed from the gold rush and the days of the wild west. The state had grown rapidly, and the Capitol Building was filled to overflowing. Many state offices had been established in San Francisco, including those of the Supreme Court. There was some doubt about just how firmly rooted in Sacramento the state capital was. Civic leaders thought they could cement Sacramento’s status as the capital city by consolidating the state’s presence here. So the city cleared and donated to the state the land on which to build this building and its companion state office building. The first four floors of this building were to become the home of the State Library, then located in the Capitol. The top floor would boast a magnificent octagonal courtroom with a domed ceiling, surrounded by wood-paneled chambers for the justices of the Supreme Court and the Court of Appeal. But as the building neared completion, a problem developed. One of my predecessors, Chief Justice William H. Waste, declared that the Supreme Court would refuse to occupy the attic of this building. So the courtroom was replicated in all of its architectural glory, save the domed ceiling, in this space on the first floor. Still, San Francisco’s leaders were not to be out-maneuvered. They arranged to donate land for the construction of a new state office building in San Francisco’s Civic Center, just across from City Hall. It, too, would contain a magnificent courtroom and chambers for the Supreme Court. As it happens, that building was completed in 1923 and has been the principal chambers for the California Supreme Court ever since. The structure in which we are gathered today was completed five years later, in 1928. It has provided a splendid and historically significant home for the State Library, and a presence in the state capital for the Supreme Court. For two calendar sessions each year, we travel to Sacramento to hear arguments in this wood-paneled courtroom that Justice Mosk found so beautiful. Finally, this building is a fitting memorial to Stanley Mosk because it sits in the shadow of the State Capitol. Stanley was fascinated by government and politics, and he was possessed of considerable political acumen. He had served as an important advisor to Governor Olson, and sought and achieved high political office himself when he was elected to serve as California’s Attorney General. And though his direct involvement in the political world ended when he joined the court, his interest did not. Nor did his keen political insights diminish. I offer you as one example Stanley’s actions in the mid 1980’s, when the California Supreme Court found itself caught in a political firestorm. Stanley Mosk was among the justices up for retention that year. As his colleagues were forming campaign committees and raising money and preparing television commercials, Stanley announced that he would do no such thing. Instead, he declared that his expenditures would be limited to the 22-cent stamp then required to mail his election papers to Sacramento and that would be only if he chose to seek another term on the court, which he had not yet decided to do. That brilliant noncampaign threw any potential foes off balance and kept him out of the campaign cross fire. And Stanley was delighted when friends around the state began sending him 22-cent stamps, encouraging him to continue on the court. There is a postscript to this story, by the way. Like the good politician he was, he wanted to keep his options open as long as possible. Stanley waited until the last possible moment to reveal whether he would seek retention for another term. He waited so long that when he finally decided to run, he feared his paperwork might not make it to Sacramento on time. So the populist plan for a 22-cent campaign went by the wayside. Stanley’s papers were delivered by overnight mail at a cost of $10.25. Now all those who come to this historic home of the library and courts, standing in the shadow of the State Capitol, will be reminded of the great contributions made by our highly esteemed and much-loved colleague, Justice Stanley Mosk. Several speakers will comment today on the dedication of the Stanley Mosk Library and Courts Building. It is first my pleasure to introduce Senate President Pro Tem John Burton. SENATOR BURTON: Thank you, Mr. Chief Justice. My memories of Stanley are not going to be of his great legal mind, although when I did work in the Attorney General’s Office, the old-timers there that had worked through many Attorney General’s going back to Ulysses Webb said that Stanley had the finest mind of any Attorney General they ever served under. Of course, they never had the opportunity of serving under Bill Lockyer. I would also like to acknowledge the widow of a very dear friend of Stanley’s, Geri Gonzalez, widow of Joe Gonzalez, a former colleague of mine. They were very close to the Mosk family. I first met Stanley when he was running for Attorney General. My brother Philip and another member of the Assembly named John O’Connell were the only people north of the Tehachapes supporting Stanley for Attorney General. And they were supporting him against our own state senator and a neighbor of ours in San Francisco, Bob McCarthy. I could not understand how Philip could support somebody from Los Angeles against one of our friends from O’Neil’s Drugstore, and he explained to me that there were things more important than playing pinball machines at O’Neil’s Drugstore and told me, you have to meet Stanley Mosk, which I did. I remember his billboards, which were kind of orange on blue with Mosk written in almost a kind of a cuneiform lettering that just stood out no matter where you went. When I got out of law school, my brother informed me that I ought to go to work in the Attorney General’s Office because it was a good ballot designation. He was always thinking ahead. So I went down for an interview with a gentleman named Ted Westfall who was the head of the Civil Division. And for me, I was very well dressed. I had an alpaca sweater, a pair of clean khakis, some saddle shoes, and a nice new T-shirt. I went in for the interview, and I thought I kind of did all right until my brother told me that after it was over, Ted Westfall called Stanley and said, “General, this young Burton you sent in, he came in without a suit, without a tie, and with a pair of saddle shoes. Clearly, we’ve loved Stanley ever since. I was there when he had Franklin Williams in the constitutional rights department, first department ever on that; Wally Holland was in there, antitrust and consumer protection; Charlie O’Brien, criminal; Ted Westfall, who was like a “career assistant attorney general” in charge of the civil division. But it was a wonderful – it was a wonderful place to work in those times. He was a wonderful, wonderful boss. But most importantly, he was a wonderful person and he and Edna at that time were just very, very close to Philip and Sala, and I got to tag along. It was my honor, when I became elected President Pro Tem of the Senate, I was sworn in by Stanley. Richard Mosk and I kind of grew up together. He as the son, I as his little brother. I just think Richard Mosk’s appointment to the Second District was a wonderful thing and it was actually one of the quickest appointments that the Governor ever made. The Governor is a little slow in making appointments to the judiciary, as you all may figure out at some point in time. But it took him very little time to recognize Richard Mosk’s ability and appoint him to the Second District Court of Appeal where he will follow in Stanley’s footsteps. I would like to say about Lisa Reinertson and the sculpture, this is the second time I tried to get her to do something. I tried to get her a while back to do the sculpture of George Moscone for the San Francisco City Hall. And there had been a problem with the first bust, if you will. The bust was created by Lisa’s mentor, and she just felt in all good conscience that it would be wrong for her to try to surpass it. I understood it; haven’t forgiven you. She is so great at what she does. If you can take a look at Stanley here, or if you ever get down to our city hall and those of you that are old enough to have ever seen the father of our new-to-be Secretary of State–former mayor and congressman, former State Senator Jack Shelley. I mean, she is as good as it gets, and I am very pleased that she took this appointment to do this. I am honored that I could speak a little bit too long for Stanley. But he was part of our family, very close, and I am sure he and Philip and Saul are upstairs right now saying, “Why the hell doesn’t the kid sit down?” So I think I will. CHIEF JUSTICE GEORGE: Thank you very much, Senator Burton. It is now my pleasure to introduce Assemblymember Ellen Corbett, Chair of the Assembly Committee on the Judiciary. ASSEMBLYMEMBER CORBETT: Thank you very much, Mr. Chief Justice for granting me the honor to make a few comments about this wonderful jurist. As I noted at the dedication of the statue, it is truly fitting to name this building that embodies our constitutional tradition after such a legendary prizefighter for justice. Many of you personally knew this man’s great courage and commitment to justice. The judicial landscape Justice Mosk painted is clear and unambiguous. Whether writing for the majority or teasing the majority from the back bench, Justice Mosk always did what he felt was fair and just, even when it could lead to painful criticism from those he most sought to protect. As Dr. Martin Luther King once said, the ultimate measure of a man is not where he stands in moments of comfort and convenience, but where he stands at times of challenge and controversy. No one ever doubted that Justice Mosk was always up to that challenge and would never shy away from the controversy. We have all heard, and many of you have personally experienced, the long list of nationally recognized judicial decisions authored by this legal pioneer. But oftentimes it is the more quiet and less renowned opinions by judges that speak volumes about their character and their compass. One such opinion by Justice Mosk involved family law. In that case almost 25 years ago a quadriplegic father had lost custody of his two children simply because the trial court judge thought a normal relationship would be impossible. Justice Mosk, as he would so many times in his legal career, bucked the typical sentiments of the time and, in this case regarding those with disabilities, he wrote in strong and forceful language an opinion reversing the trial court and holding that a physical disability is not in itself justification for depriving children of time with their parent. What a great reminder of this man’s deep humanity. And, of course, it is not just Justice Mosk’s human side we celebrate here today, he had a penetrating legal mind, as well. As many legal scholars have commented, perhaps Justice Mosk’s most important contribution to the development of our law was his articulation and steadfast offense of the doctrine of independent state grounds. This legal principle establishes that in protecting individual liberties, the states have the power to write and interpret their own constitutions more expansively than the federal Constitution. This legal doctrine, which was pursued so tenaciously by Justice Mosk and which was upheld and supported by an unanimous United States Supreme Court, is central to so much of the key civil rights, consumer protection, and environmental reform efforts made by the Legislature in the past decades, and it stands as a hallmark to Justice Mosk’s legal legacy. The Justice Stanley Mosk Library and Courts Building will be a reminder to future generations of a man who did just that and shall continue to serve as an inspiration to all who enter here that the heart and the soul of California’s legal tradition is to protect those least able to protect themselves. Thank you. CHIEF JUSTICE GEORGE: Thank you very much, Assemblymember Corbett. It is now my pleasure to introduce Mrs. Kaygey Kash Mosk, Justice Mosk’s wife. MS. KAYGEY KASH MOSK: Thank you, Chief Justice George, Associate Justices of the Supreme Court, Justice Richard Mosk, President of the Senate Pro Tem Burton, Dr. Starr, Ms. Corbett, Ms. McEnvoy, and other very distinguished and honored guests. It is such a great privilege for me to be here today as we rededicate the state Library and Courts Building in memory of my late husband, Justice Stanley Mosk, and unveil a statue in his likeness. I thank you, Chief Justice George, for your counsel and assistance; I thank you, Senator Burton, for authoring the state concurrent resolution renaming the building; the Legislature for commissioning the statue; and the artist, Lisa Reinertson, for creating it. Stanley was a modest man, and his thoughts about how he would be remembered would never have been so grand as to include the renaming of this building and the unveiling of this remarkable statue. The building appropriately honors Stanley. And I, as his wife, find it quite fitting for it is more than just a stately edifice to be visited and admired; it was one of the places where Stanley labored during his distinguished 37 years on the Supreme Court authoring almost 1700 opinions. His labor did not weigh him down, but in fact invigorated him. Fortunate man that he was, Stanley loved the law and whatever he accomplished. In his lowkey manner, he provided legal scholarship and leadership, for Stanley’s passion was to do justice, to do everything in his power to ensure that every man and every woman, whether rich or poor, famous or unknown, was treated fairly and was accorded equal dignity in the eyes of the law. Stanley’s passion for justice often compelled him to take very strong positions on controversial issues. Regardless of the outcome, Stanley’s respect for colleagues who may have had differing opinions never diminished. Stanley extended great courtesy to all of them; and they, in turn, extended great courtesy to him. This statue appropriately honors Stanley. As all of you may know, although Stanley was quite a dashing fellow, he was not quite seven feet tall! This statue is larger than Stanley was, and I found that to be so fitting. For Stanley himself was larger than life. His energy was boundless, his mind far-reaching, and his heart all-encompassing. He lived a life of honoring humanity, protecting those in need, and fighting for what he believed was right. And only a larger-than-life statue could match such an achievement. Stanley passed away on June 19, 2001. He is missed by so very many. But I miss him every day, for we were constant companions sharing our innermost thoughts and feelings. In fact, we were each other’s best friend. Today, however, is a time to rejoice as we rededicate this building, unveil this statue, which together with all the opinions he authored will ensure that Stanley’s name will, indeed, be remembered. Stanley would be so very proud, and I am very proud to bear his name and his memory. On Stanley’s behalf, I thank each of you, especially the administrative staff who have worked so diligently, for this very great honor and tribute you do him today. I thank you all. CHIEF JUSTICE GEORGE: Thank you very much, Mrs. Mosk. It is now my pleasure to introduce Ms. Jean McEvoy, president of the Women Lawyers of Sacramento, who will speak on behalf of the Sacramento Bar. MS. JEAN McENVOY: Good afternoon, Chief Justice, Associate Justices. It is a rare privilege for me to participate in this rededication as the representative of women lawyers and as a member of this legal community. Justice Mosk’s outspoken and sound opinions for many years have shaped excellent legal principles for California. His solid legal reasoning in constitutional law will remain for years to come and continue to keep precedent in place to protect civil liberties. His opinions will continue to teach lawyers in this state how to properly represent their clients. Justice Mosk was never secret about his interpretation of the law and what the law should do to protect persons. Those of us in the Sacramento legal community mourn his passing. We are very pleased that he is honored by the naming of this building and that his statue will grace our community. Thank you. CHIEF JUSTICE GEORGE: Thank you, Ms. McEvoy. It is now my pleasure to introduce our final speaker, the son of Justice Stanley Mosk, the Honorable Richard Mosk, Justice of the Second District Court of Appeal, Division 5. JUSTICE RICHARD MOSK: Chief Justice George, Associate Justices, members of the judiciary, Senator Burton, Assemblywoman Corbett, Attorney General Lockyer, public officials, guests, and certainly my colleagues from the Court of Appeal, including Justice Paul Turner who came all the way from Los Angeles, which I appreciate very much. The Mosk family is proud and grateful for this honor, and we thank Senator Burton and the Legislature. Here today are my wife Sandy and my daughter Julie and my father’s wife, of course, Kaygey; two great grandchildren whom Stanley Mosk knew, Noah and Jenna, and third, Samantha, just born to my son Matthew. He has been covering the Maryland gubernatorial race for The Washington Post. Noah, Jenna and Samantha, just born to my son Matthew and his wife Karen, will someday point with pride to this building. And I am sure my mother, Edna Mosk, would have been proud. Also here are friends of my father over many decades. SENATOR BURTON: You should chair Appropriations. JUSTICE RICHARD MOSK: Thomas Carlisle once said that a single picture of a man is worth more than all the books written of him. I hope this fine sculpture by Lisa Reinertson will justify that opinion. He treasured the friendship he had with such people from all sides of the political spectrum. He was particularly fond of the Burtons. Not just because they were Democrats and supporters, although that helped, but he loved their gusto, their commitment, their loyalty, their sense of humor and their principles. He admired each justice of the Supreme Court with whom he sat. He spoke of the great intellect of the current court members. He said that each Chief Justice brought a special quality to the position, but Chief Justice George was the finest administrator he had ever observed. He treasured the friendship with each of the justices, people like Justice William Clark. He admired the way Judge Clark treated people with respect, from the janitor in the state building to the President of the United States. Stanley Mosk lived through a tumultuous time: Aggression, wars, McCarthyism, assassinations, unsuccessful judicial retention elections, and terrorism. I am reminded of Harry Lime’s remark in the movie The Third Man: “With 30 years of noisy, violent, churning under the Borgia of Italy produced Michelangelo, Leonardo da Vinci and the Renaissance, while 500 years of peace, quiet, and harmony in Switzerland produced the cuckoo clock.” It took these times to produce Stanley Mosk. He loved being a judge. He presided over many high-profile cases: The Bel Air socialite murder case that went to the United States Supreme Court; the Charlie Chaplin paternity case; the Marilyn Monroe-Joe DiMaggio divorce; rendering unconstitutional racial restrictive covenants. He also married many movie stars in our home. I always had to clean up the rice. “If I am the first executive secretary in California history not to be appointed to the Bench, I shall be looked upon with suspicion for many, many years by lawyers, the Bench, by members of our own and opposing political party. “I do not contend that I am qualified to sit on the Bench solely because I have been your executive secretary. I have the necessary temperament and other qualifications, including education, sufficient years of trial practice, experience at holding hearings and writing legal and other publications. “If you need convincing on any of these points, merely ask any of the judges on the Bench, from municipal court to Chief Justice Phil Gibson.” This showed a vulnerability not often displayed, at least not to me. Those who read the sports page applaud the highly paid NFL player Pat Tilmann for recently enlisting in the Army. But my father, exempt from the draft as a judge and with vision of 20-800, did likewise in World War II. The Director of Selective Service allowed him to memorize the eye chart. Young lawyers cannot identify Earl Warren’s picture in my office. Few could identify the great state court judges of the past: Shaw, Coolie, Vanderbilt, Fall, Traynor, Tobriner or even Holmes and Cardozo. These are members of a pantheon of great state court judges into which some have placed Stanley Mosk. Perhaps for a generation, as my father’s great cases still remain in the case books, some will be inspired not only by his work, but will draw inspiration from his life. Stanley Mosk proved that young people can make a mark in law and public affairs. One can succeed in law and politics coming from modest means and from graduating from a local, non-Ivy League law school. As the first Jew to be elected to statewide office, he proved it could be done, even with an odd last name, so that others ran and have been elected; one can be liberal and still, through the sheer force of reason and pleasing personality, retain the respect and friendship of those more conservative; one can be highly productive in the elder years. And, yes, older people can be trusted to recognize when or whether to retire. Scholars suggest that the Greeks and Romans built their cities and civilization on the worship of their ancestors. While those ancient religious beliefs disappeared, the tradition remains. The monument shall be a call to public service, a call all of you here today have followed, and a call to our descendents that we hope will not go unheeded. CHIEF JUSTICE GEORGE: Thank you, Justice Mosk. On behalf of the court, I want to express our appreciation to all those who made this dedication of the Stanley Mosk Library and Courts Building possible and to those who contributed their remarks this afternoon, as well as to Lisa Reinertson, the artist who created the magnificent memorial to Justice Mosk that now stands outside this building. In recognition of the historic nature of this occasion, and in accordance with our custom, it is ordered that the proceedings of this special session be spread in full upon the minutes of the Supreme Court and published in the Official Reports of the opinions of this court, and that copies of these proceedings be sent to Justice Mosk’s family. And in conclusion, I want to thank Cheryl Redlich, a court reporter of the Sacramento Superior Court, for transcribing today’s proceedings. I also wish to announce that there will be a reception in Room 500 immediately following the special session. The seven of us up here on the Bench will be unable to join you. We have to get back to work and hear our afternoon calendar of cases.